Who will take over from Hague in Richmond? William Hague’s impending departure from the Commons has opened up a vacancy in one of the Tories’ safest constituencies in the country. So, we’ve opened up a market on who will be their candidate for the next general election. The Daily Mail have speculated that Selina Scott could be in the frame. If Boris is to return to Westminster in 2015, he won’t find a safer seat, although being an MP for the Yorkshire Dales and Mayor of London simultaneously is going to be a hard sell. 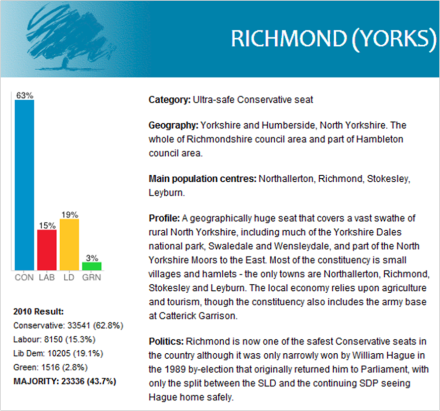 Wendy Morton and Robin Scott appear to be the most plausible candidates from the local party machine. If anyone has any other suggestions for likely candidates, feel free to post them here. Constituency profile courtesy of UK Polling Report.